If you’re the parent of a child diagnosed with Down syndrome, you may at first feel overwhelmed by feelings of loss, guilt, and fear. This is normal and experienced by the majority of parents first learning this news. Talking with other parents of kids with Down syndrome may help you deal with the initial emotions and find ways to look toward the future. Many parents find that learning as much as they can about Down syndrome helps alleviate some of their fears. Things will start to look better with time and support. We are here for you! Please contact our New Parent & Family Support Coordinator with ANY questions. If you would like someone from USOD to contact you, complete and return this Authorization Form. One of our goals at the Up Side of Downs is to provide one on one support to new families that have just received a diagnosis of Down syndrome. We can provide this in many different ways depending on what is most comfortable for your family – by phone, in person or via email. We invite you to join us at our Baby & Toddler Playgroups where new parents meet and share advice with each other. Many new parents find it helpful to talk to other parents who are experiencing similar issues as yourself. Get connected with us on Facebook and Twitter and for online support. Babies with Down Syndrome is a guidebook for new parents that covers all aspects of care for babies and young children with Down syndrome. It includes daily care, family life, intervention, education and legal and medical issues. Gifts is a poignant collection of personal stories by mothers describing the gifts that Down syndrome has brought into their lives. A New Parent Guide is a collection of information about raising a child with Down syndrome in the Northeast Ohio area. It features short articles about Speech Therapy, Occupational Therapy and Physical Therapy, breastfeeding, financial information including waivers, SSI, and Medicaid, special needs trusts and a list of our families recommended doctors and therapists. Down Syndrome & Breastfeeding is a website that provides print and internet resources on the subject. To request a complimentary New Parent Packet, please contact our New Parent & Family Outreach Coordinator. Remember, your baby is a baby first. Don’t let his diagnosis define him. 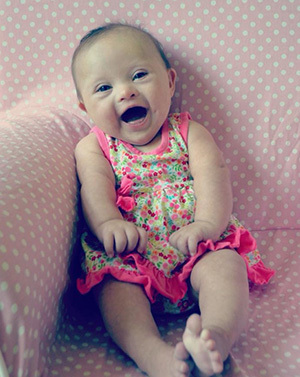 Children with Down syndrome can lead very full and happy lives. They can read, go to your neighborhood school, ride bikes, swim, play sports, be in the marching band, be the Homecoming queen, go to college, get married and own their own businesses. We invite you to watch this video called Just Like You created by the Down Syndrome Guild of Greater Kansas City that highlights some wonderful friendships and how kids with Down syndrome are just like any other kid. Most of all, enjoy your baby!